With long summer days gradually giving way to long autumn evenings, it’s time to start thinking about learning new skills and mending old clothes. The Bungay Sewing Circle has been on hiatus for the summer but will reconvene in October to help you get through that pile of sewing, run up a new outfit or even to make your very first stitches. The first meeting of the new season is on Sunday 16th October at 3pm, Bungay Library. The group will meet on the 3rd Sunday of each month until summer 2012. Sunday 16th October will also form the start of a 4 week beginner’s sewing course which will run for the following 3 sundays. This course is aimed at complete beginners who would like some help to get started on the sewing machine, make simple alterations, repair damaged clothes and read a pattern in order to make a simple garment from scratch. If you are interested in a monthly natter and sewing session, learning a new skill or even passing on a skill (e.g. crochet, knitting, weaving, spinning etc.) please come along! This post first appeared on This Low Carbon Life, the Transition Norwich blog and records a recent (and very fruitful!) visit to Cathy from the Abundance project in her thriving orchard. Outside there is the most extraordinary sunrise. The sky is crimson pink over the sea, full of long clouds like flames edged with violet. It’s completely still. I’ve stumbled out of the tent to come upstairs to write and have been mightily distracted from my task. It has been beautiful for the last two days, warm and misty and embracing. After a tough and grey August, September has arrived with all its bright fruit and luminous skies. You can uncurl yourself in such mellow weather and never want the day to end. Two crucial lessons I’ve learned about English summers: 1) take advantage of the lovely moments and store them up for the long dark months ahead, and 2) don’t do this with your mind, do it with your body. The body is intelligent in ways our heads are not. You can look out of the window and say to yourself hmm nice sunrise and go back to the computer two minutes later, but looking at views keeps nothing of value or well-being. You can store the thought of sunrise but not the experience. And when it comes to earth matters experience is what counts. To store up sunlight and warmth you have to go outside, swim, walk, sleep under stars and get in synch with the elements. Taste rain, feel bark, eat fruit. SAMPHIRE Reading Elena’s post last month about recognising the shift of season with the sound of jays I was shocked to realise that I had hardly been out in the wilds this summer. So I went down to the marsh and there the blue-eyed birds were, hollering in the oaks, the ground full of spilt acorns. The flowers were still there too – angelica and marsh thistle – honeybees gathering nectar and pollen from musk mallow, watermint and bird’s foot trefoil. 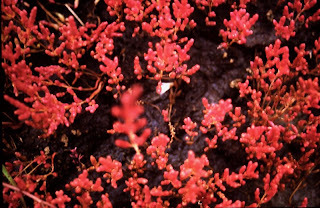 Later, encouraged by listening to Fergus the Forager at Uncivilisation, I walked home from Southwold along the Blyth, snacking on sharp and salty sea beet leaves and reddening samphire, gathering blackberries, elderberries and damsons for that dark autumn porridge experience at breakfast. The tracks were full of scented sea asters and wormwood and the air with sounds of migration: holidaymakers flocking back to the city, barnacle geese arriving from Siberia. BLACKBERRY What was striking about Fergus was the way he imparted plant knowledge. He was speaking in words, but most of what he was saying came from his direct physical relationship with the natural world. You could tell by the way he stood alongside the three humble and vigorous plants he chose to talk about – hogweed, nettle, bramble – that he spent his life searching the undergrowth in the wind and the rain, chopping and tasting and experimenting in a field kitchen. He loved the plants for their usefulness, for the way they were constructed, but also for their beauty. “It’s about being creative,” he said and handed round a little jar of blackberry stem stars, which he had made from cutting bramble shoots crossways in April when they were still bendy. HAZEL In between the intellectual debates and discussions at the festival I found a physical workshop outside the Doing Space Yurt called Embodying Uncivilisation, which (as far as I could tell) was all about getting out of your mind and instead walking and talking with your whole body. As soon as you allow your rigid body to become bendy and free, let your eyes take in everything around you, your feet feel the ground beneath you, that introspective unkind thought-realm we spend most of our time in ceases to engage your full attention. Instead you turn your consciousness inside out and start to absorb your natural environment, aware of light, sound, atmosphere, scent . . . those are the things you remember. Uncivilisation was about sitting by fires, walking through the dark woods, sleeping in the open as much as it was about intellectual exchange. My first conversation was with Martin and Mary Kibble-White about their improvised rocket stove (made from a coffee tin and an heirloom kettle) and the supple hazel branches Martin was collecting for his workshops on hurdle making. DAMSON Downstairs the kitchen table is full of fruit and the chest of drawers covered in stalks and small brown envelopes full of seeds – dill, parsley, fennel, sunflower. This week we went to Cathy’s to pick apples for the Waveney Greenpeace Fair tomorrow (we’re running the Transition Tea Tent with Nick) and damsons for jam. Cathy runs the Abundance project for Sustainable Bungay, which gathers fruit from neighbourhood or garden trees that people don’t need for themselves and redistributes it to those who do. In our neighbouring initiative in Beccles this has become a full-on community project. With us it’s a smaller venture. We have Abundance tables at all our events, giving fruit away at our Happy Mondays and Bungay Bees events, exchanging at our Give and Take Days and Garden Produce Swaps in the Library community garden. All part of the gift culture intrinsic to Transition. In Cathy’s small orchard the plum and gage trees were bowed down with fruit. How come, I wondered as I picked the local giant Norfolk Beefings, our minds are so full of lack and loss and our trees are so full of abundance? SEA BUCKTHORN Now I’m going down to the sea to have breakfast in the dunes with Mark. The sun is up. 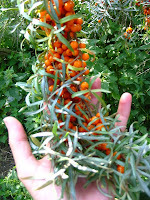 Afterwards I’m going to make a tincture from those sea buckthorn berries we gathered yesterday (a very sticky and spiny experience!) for a winter tonic. The handsome wavy-leaved sea buckthorn grows all along this coast, sometimes as a windbreak in coastal gardens, and its orange fruit is sharp and tangy and has a distinctive scent almost like passion fruit. They are a kind of Transition “superfood”, packed with minerals and vitamins (15 times the amount of vitamin C in oranges). I say Transition because most of these powerful anti-oxidant berries, like goji from China or blueberries from the States, are high-carbon and expensive to buy. Sea buckthorn has been used for centuries in the East and in Siberia as a medicine (mostly as seed oil for the skin) and it grows here well and, like those other great tonics, beetroot and elderberry, is incredibly cheap. Free in fact. The tea from the leaves and berries is delicious too and they are great sprinkled in a slaw. Check them out! Sustainable Bungay has been busy making appearances over the Summer, with stands at several fairs and festivals. At the Harlequin Fayre outside Norwich, Bungay Community Bees was given its own tent in the Sustainable Futures area courtesy of Mell Harrison, where it spent the weekend happily amongst the living willow demonstrations and surrounded by limes and elders, welcoming any and all passersby. The Transition Towns tea tent at the Waveney Greenpeace Fair at Henham Park on 4th September was a true Sustainable Bungay affair and a great success. Organised by Nick, manned by Charlotte, Daphne, Gary, Kris, Lesley, Margaret and Mark with 250 plus cakes and biscuits baked by Gemma, Josiah, Margaret and Frances, we got a good team flow going on the day, keeping the kettle and teapots full (mostly), refilling the water barrel, washing up – and swinging our hips to Norwich Samba as the beat went on at the Mainstage. Bike week this year started off with a children’s art competition at Bungay library – this year Margaret Sheppard, Trustee of the Beccles and Bungay Cycle Strategy, themed the competition on Sustainable Transport which resulted in some amazing pictures from local children. Two children from Ellingham Primary school won joint first prizes and it was very hard to judge as all the entries were of a high standard. On midsummer evening 11 people, plus 3 others on the Community bus, set off down the lanes to St Peters Brewery for Green Drinks (our monthly discussions over a drink). June’s theme was all about cycling, community transport and sustainable travel. On Thursday 23rd, the Godric Cycling Club and Beccles and Bungay Cycle Strategy organised a free Dr Bike service. After the Dr Bike checks, children from St Edmunds Primary school completed a bike training ride and were delighted to receive their free spoke accessories and Bike Week balloons (all of which were courtesy of Team Green Britain, the national sponsors of Bike Week). Beccles and Bungay Cycle Strategy offered free bells to the children for their bikes. A group of 27 cyclists converged for lunch at the Rumburgh Buck as the finale to Bike Week in the area. 11 cyclists from Bungay, 11 from Beccles and 5 from other local areas all enjoyed a glorious day’s riding and agreed that it was a great way to end Bike Week celebrations. The Waveney Greenpeace Fair took place this Sunday at Henham Park near Blythburgh. All the 21 previous fairs had been held in farmer Paul’s post harvest stubble fields in St. Michael South Elmham, so this was a brand new venue. I did wonder beforehand if recreating the mellow, intimate atmosphere the fair is known for might be difficult in such a different place, parkland rather than farmland. But with the tents and stalls framed by beautiful mature lime trees, and the months of preparation by all the organisers (hats off to everyone, you know who you are! ), the stage was set for what turned out to be a great day. (The one fight was valiantly held in check by several green men, so I won’t dwell on that). Nick had spent the previous three days organising and setting up the Greenpeace Tea Tent, which was manned this year mostly by Sustainable Bungay with ‘a little help from our friends’ in Diss. Charlotte and I set off on our bikes in the morning with bags of display posters and photos (laminated by Gemma and Eloise) and a jug of cut flowers in the bike basket and joined Nick and Margaret to prepare for a day of tea and cake provision. Daphne, Gary, Lesley and Kris arrived a little later and we all got into a good team flow of keeping the kettle and teapots full (mostly), refilling the water barrel, washing up – and occasionally swinging our hips to Norwich Samba as the music carried over to us from the Mainstage. Friends from Transition East and Beyond came to visit, including Chris from Norwich, Gill from Diss, John and Carol from Downham Market and Kristin and Sim from Transition Bristol. It was lovely to catch a few minutes’ chat with everyone inbetween tent duties. Our Waveney Greenpeace/Transition Towns Tea tent with its Sustainable Bungay and Bungay Community Bees display boards, Abundance table with Cathy’s damsons and Norfolk Beefing apples, Nick’s green tomatoes and cabbages, and Margaret and Charlotte’s lovely flowers on the tables drew people all day and when it started raining at about 4.30 everyone moved closer, shared tables and carried on chatting and drinking tea. Charlotte and I went for half a cider in the main bar at six and returned to help Nick with the last of the clearing up before cycling home, where Nick joined us for supper – which included those green tomatoes of his, fried in olive oil – delicious! If anyone would like to add their experience of the tea tent or indeed the fair please feel free to use the comments box below.